Core Values – Courage – Pro Poly of America, Inc. Certainly courage is a worthy trait for a man or woman in the profession of arms as they willingly face danger and an enemy intent on harm. 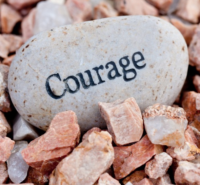 But, what role does courage play in a manufacturing organization? Why adopt courage as a Pro Poly corporate value? While most of us thankfully will never have to muster the level of courage necessary to face and overcome an enemy, we do need institutional courage to make corporate decisions based upon opportunity rather than fear of failure. We must also have individual courage to do the right thing even if it may result in personal tension or strife. And, we must have courage as leaders to ensure our entire team remains steadfast to the fundamentals of quality and precision manufacturing. The value of courage for an organization makes a lot of sense, and at Pro Poly we celebrate the courage of our team to continue to make us a world class leader in high quality plastic fabrication.